I hesitate to use the word sleeper too much because the term has been overused to the point of losing its meaning and readers often associate that word with no-name fantasy football players. I prefer the word "undervalued." As a drafter, this is what I am always looking for: value. If I can get a 3rd round value in the 6th round, it gives me a significant relative advantage over my opponent. The following players (e.g. Denzel Perryman) most people have heard about and really aren't considered "sleepers" in the traditional sense. However, this doesn't mean they can't provide just as much relative value as a no-name player that comes out of nowhere. 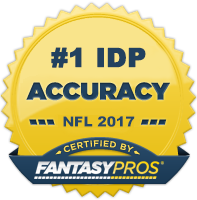 In this article, I recommend four players at each of the 3 defensive positions (DL, LB, DB) who I believe will be significantly undervalued heading into the 2016 fantasy season. DE Mario Williams (MIA) - Williams is coming off arguably the worst season of his 11 year career. Despite being a huge disappointment in 2015, I'm still a believer in "Super Mario." He looked great last pre-season and was primed for a monster year. However, Rex Ryan drastically misused his talents in Buffalo by forcing him to do things like dropping into coverage on many occasions. Miami will let him do what he does best - get after the quarterback. If Cameron Wake returns to full health, the Dolphins could have one of the more dangerous pass-rushing fronts in the NFL. I think Williams will slide in drafts this year based on his poor 2015 performance. I plan on taking advantage of that and snapping him up as my DL2- in any league I can. DE Jabaal Sheard (NE) - The Patriots have a way of taking highly-touted players who seemed to be on the decline and rejuvenating their careers. Jabaal Sheard is a great example of this fact. He posted eight sacks in just 557 snaps a year ago and will step into a full-time role with the departure of Chandler Jones to Arizona. It's telling that the Patriots were impressed enough with Sheard to trade arguably their best defensive player this off-season. Along with Robert Ayers, Sheard is one of my top sleepers heading into 2016 and I expect DL2+/DL1- numbers. DE Robert Ayers (TB) - Ayers has been one of the most productive fantasy ends on a per snap basis throughout his career. Last year he ranked third in the category, behind Ezekiel Ansah and JJ Watt. Now that he's finally garnered a starting role with Tampa Bay, I'm expecting DL2+ numbers. DE Kony Ealy (CAR) - The retirement of Jared Allen gives Ealy the opportunity to have a full-time role at right defensive end. On paper his numbers last year weren't mind-blowing, but he did have a sack in five straight games in weeks 8-12 and had a very strong playoff performance. I see his development along the same lines as DeMarcus Lawrence heading into the 2015 season. If one of the higher floor DL3s (Casey, Richardson, Tuitt) don't appeal to you, Ealy is a great risk/reward pick at that stage in the draft. ILB Danny Trevathan (CHI) - Trevathan was perhaps the most productive two down linebacker in the NFL last season. I expect him to see a full complement of snaps in his new town of Chicago. The Bears defense will likely see their fair share of time on the field, so I like Trevathan to exceed his 2015 production. ILB Denzel Perryman (SD) - Perryman is one of my top sleepers heading into the 2016 season. He received valuable playing time during the second half of last year and posted very strong numbers despite leaving the field in subpackages. In fact, he led the NFL in tackles per snap registering a tackle 1 in every 5 plays! He's fully expected to garner an every down role this year and, with that said, I think 90+ solo tackles is well within reach. His current ADP is LB32 but chances are very good he exceeds that draft position come years end. ILB Demario Davis (CLE) - Call me crazy, but I like Davis this year (I feel like I say that every year). He's been a matchup LB3 throughout his career, but has shown flashes of being a dominant physical downhill thumper. The big thing is he no longer has David Harris next to him stealing tackles away and he should see plenty more opportunity on a poor team like Cleveland. I don't see any reason why he doesn't lead the team in tackles and potentially eclipse 90+ solo tackles. MLB Ben Heeney (OAK) - Heeney isn't a household name by any means, but due to the lack of talent at the MLB position in Oakland, he was handed the starting reigns towards the end of last year. Malcolm Smith sucked up the majority of tackles in that defensive front seven, but Heeney did have a 2.5 sacks in his last seven games and surpassed 7 total tackles three times during that span. He will wear the "green dot"/helmet communicator for the Raiders defense which means he's a near-lock for every down status further bolstering his prospects. He could very well wind up as one of the best value picks of the year. SS Antoine Bethea (SF) - Like Eric Weddle, Bethea has been one of the most consistent fantasy safeties in the league throughout his 11 year career. He's in a good situation playing on a defense which should be near the top of the league in time spent on the field. My only concern is that second year player Jaquiski Tartt may start cutting into Bethea's playing time. It's a situation to monitor this preseason. Whoever garners the full complement of snaps at the position should prove to be a strong DB2 to DB2+. SS Calvin Pryor (NYJ) - Pryor is a player who seems to have not yet reached his full potential. He's a good fit for Todd Bowles' scheme but hasn't adjusted to the playbook as quickly as the team desired. Heading into his third season, I'm banking on marked improvement in terms of tackle production. If he plays up to his potential, 70-75+ solo tackles is easily doable. SS Clayton Geathers (IND) - Geathers is perhaps by top sleeper right now at the DB position. He didn't get that much playing time last year (270 snaps), but was very productive when he was on the field. The Colts willingness to let Dwight Lowery leave in free agency signals to me they are ready to hand the starting strong safety reigns to Geathers. I expect him to be the leading tackle producer in that secondary and second leading tackler on the team behind D'Qwell Jackson. SS Ibraheim Campbell (CLE) - Campbell played sparingly behind veteran Donte Whitner last year, but graded out positively in those limited snaps. With Whitner out of the picture, the expectation is that Campbell will secure the every down strong safety role in Cleveland. He has very nice upside as an in-the-box safety in Ray Horton's scheme. He should be one of your main sleeper DB targets this year.